Terraced rice fields in Bali has become a tourist attraction that is always admired by tourists. 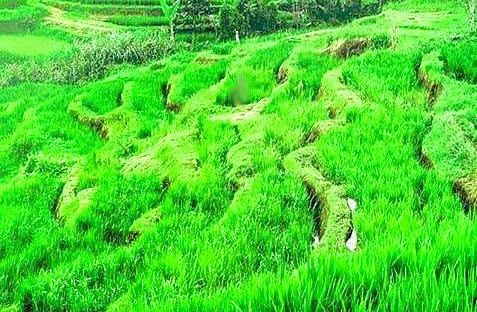 Attraction in the form of terraced rice fields in Bali the most famous is Jatiluwih. However, the most frequently visited by foreign tourists is terraced rice fields in Ubud, Gianyar, Bali. When the soil in the fields is being processed by farmers, these fields do not look beautiful. That looks just ground to a brownish color, with a little puddle of water. A time like this is not a beautiful sight, so many tourists feel disappointed when I saw fallow paddy rice. If the rice planting season has been going, fields will appear blue. The blue color occurs because the reflected color of the sky in the stagnant water in the rice fields. Flooded rice fields have been prepared for rice. At times like this, only in the fields Gated some farmers who cultivate land to grow rice preparation. When the rice was planted, fields not look attractive. Stagnant water is still visible. Because rice plants have not been a large body, so the rice fields not visible green color. If the rice planted was great and high, the entire surface of a puddle of water in the fields covered by the rice. If the fields are green in sight, it will be very interesting attractions. Green terraced rice fields are very beautiful and fresh eyes. In Jatiluwih throughout the year are the farmers only grow rice. Unlike the West Bali region, rice is not planted throughout the year. Attraction is also very nice terraced rice fields had to remove setres. Because the air is fresh with shades of green will make the mind calm and comfortable. Many people who have large malsah, will be heading to the fields to get peace. In the fields one can listen to the sound of birds, the sound of gurgling water, blue sky, or interact with farmers.